Today’s intraday charts update is mainly for the trend playas out there ‘coz I’m serving up a couple of channels on EUR/USD and USD/CHF. EUR/USD’s recent price action has been tilting to the downside recently. Not only that, the pair has been moving higher while respecting that there ascending channel. As y’all should know by now, one of the more conservative ways to play an ascending channel is to look for opportunities to go long when the pair is at or close to the channel’s support area. And as y’all can see, that’s where the pair is currently at. 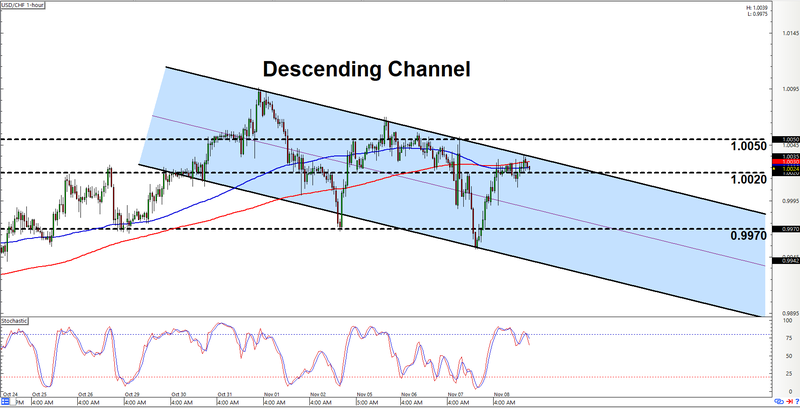 In fact, the pair already appears to be pushing off the channel’s support at 1.1400. Y’all may therefore wanna start looking for a chance to go long on the pair. Do note, however, that selling interest appears strong at 1.1450, so just make sure y’all keep a close eye on that price area if/when the pair does get there. And as always, do keep in mind that the risk for a downside channel breakout is always there. The pair would need to smash lower past 1.1360 in order to validate the downside breakout, though. 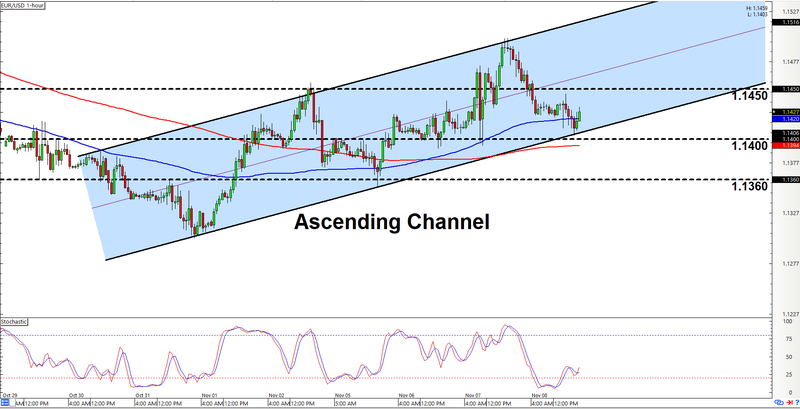 A channel has also formed on USD/CHF’s 1-hour chart. This one is a descending channel, though, so we’re mainly bearish on the pair. And as y’all can see, the pair is currently milling about just below the channel’s resistance, which is just above the area of interest at 1.0020. Y’all may therefore wanna start looking for opportunities to go short on the pair. Looking at our technical indicators, we can also see that them moving averages just recently crossed-over into downtrend mode. Stochastic, meanwhile, is already moving back down after visiting the overbought area. As usual, however, there’s always a risk that the pair may move to the upside instead. So just be ready to bail yo shorts if the pair stages a topside breakout and takes out the 1.0050 minor psychological level. Also, if/when the pair does move back down, just make sure to keep an eye on the area of interest at 0.9970 since buyers appear to have entrenched themselves there. Anyhow, just remember to practice proper risk management as always, a’ight?